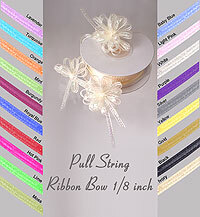 Pull String Ribbon Bow. 1/8 inches x 50 yards. Cute and fun ribbon to decorate your packages. Simply pull the string which is thread through the ribbon, and as it gathers you have the perfect little bow!